The 3B Visalia slickfork hails from the Vaqueros of California, Oregon, Idaho and Nevada and uses a traditional style tree of their choice. This 3B Visalia tree has the same narrow seat as our Wades and is popular with cowboys and trail riders alike. 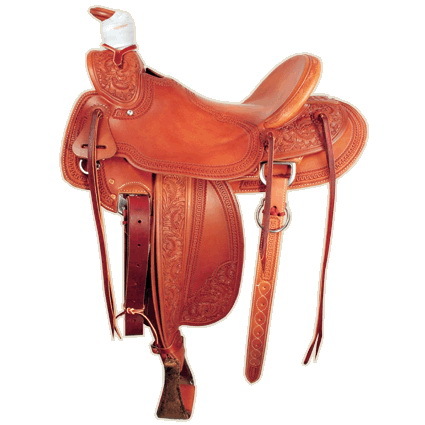 Equipped with a loop seat and outside stirrup leathers, it has an old time look to go along with it. 3B Visalia SQH on mod. QH (available with regular narrow) QH on FQH. 8″ high by 6¼” wide. #4 bally post with 3½” finished cap. 13″ to 18″ in half inch increments. 7/8 flat plate slot rear standard (other style optional). 1″ oxbows standard or your choice.